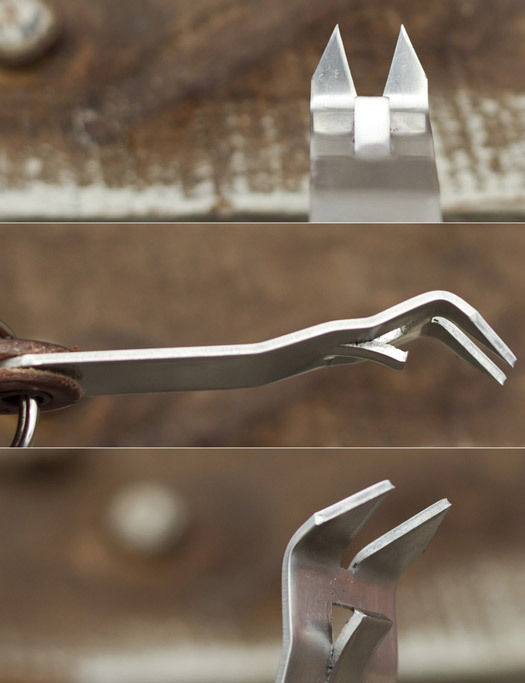 This Key Chain Bottle Opener and Folding Church Key has all the components and engineering required to last you a very long time. 100% Made in the USA. 302 stainless steel. 6oz vegetable tanned brown domestic leather. Military grade kydex holster eyelets. Nickel-plated hard drawn steel split rings. An ancient design, updated, modified and improved for modern uses. Your grandpa figured out how to rip into a fresh can of suds back in the day and for some reason, Big Beer has been trying to make it a more complicated process ever since. 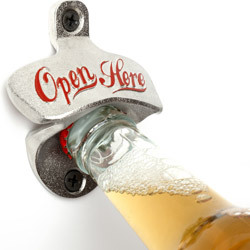 After many late nights of DIY prototype development, we invented the world’s first Patent Pending forked-church key and bottle opener that we proudly dubbed: The Original Snake Bite. We also decided to wrap the Snake Bite with leather so as not to expose anything to the sharp teeth that could be “bit”. Holding the whole thing together are military grade gun holster eyelets and hard-drawn steel split-rings. 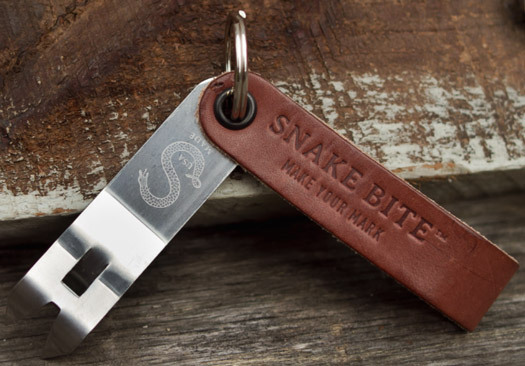 We’re proud to say that Snake Bite is 100% sourced and made in the USA, from the steel to the steer hide. We like to think grandpa would be pretty damn proud of that. We wanted to make the Snake Bite functional yet also something you would be proud to carry every day. The process, from the initial basement-prototyping sessions to the finished Patent Pending product, was a long and winding road involving multiple designs, prototypes, and 12 oz. test subjects. Eventually we landed on this simple yet functional design. There’s obviously the business end that let’s everyone around know you’re with a seasoned professional, but we've also included a slight ergonomic lift to the tool that mimics how a snake lifts it’s head to strike at it’s prey. Holding it all together is the finest American sourced and tanned leather. 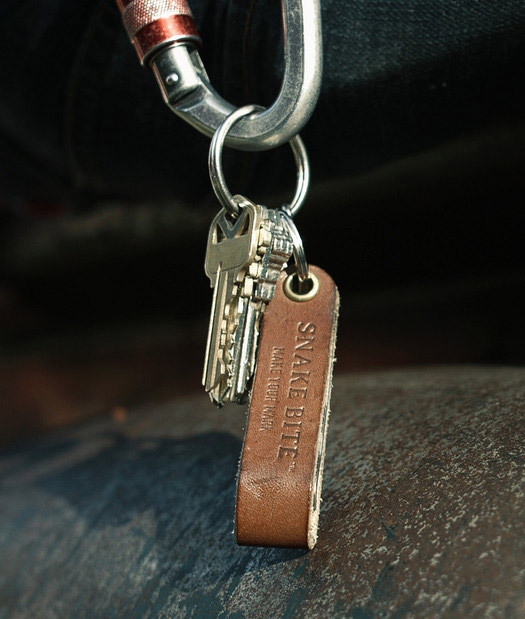 We have been carrying ours around for awhile now and can tell you that the leather patina only gets better with age. 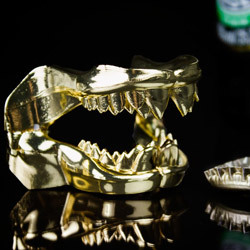 Aside from opening bottles, we also introduced two fangs that allow you to vent your canned beer. Why vent a can? Basic physics: If just the main can opening is utilized, the pouring has to stop so that air can enter the can and re-establish equilibrium. This is what causes the "glug-glug-glug" sound when pouring something from a can if it isn't vented. 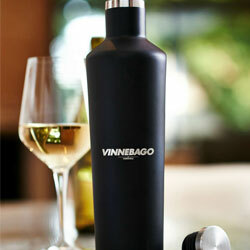 If you have venting, then air is let in which constantly keeps equilibrium in letting the liquid out smoothly. This is especially important when pouring a canned craft beer into a glass. It's worth mentioning that every canned beer has different levels of carbonation and due to that, pour results will vary. 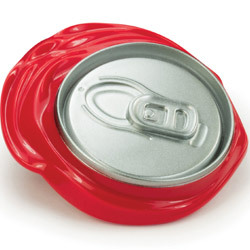 Venting also eliminates a significant amount of air you ingest while drinking straight from a can. This greatly improves drinkability, comfort, and overall experience.